The Heating and Hot Water industry council (HHIC), in conjunction with the wider industry, have produced a consumer guide detailing what people can expect from having their boiler serviced by a Gas Safe Register engineer. It is the first guide of its kind, laying out agreed industry best-practice for boiler servicing. The aim is to educate consumers on the standards they should expect from a gas engineer. It also details a list of the steps engineers should take when they visit a customer’s home and lays out a new, 10-point HHIC Customer Service Charter. The document is available to download here – It also highlights the importance of using a Gas Safe registered engineer for any work on gas appliances. “Industry has produced this consumer-facing guidance, to support the professional accredited heating engineer. We believe that by outlining what homeowners can expect from their service, it will assist with the message that ‘the cheapest quote isn’t always the best. The reason is simple; as a consumer, it is reasonable to assume when procuring a service of your gas boiler that different providers will all offer a similar, standardised, thorough high-quality service. But what constitutes a proper job? And how can consumers, especially those who might not have any knowledge of the industry, be sure they are receiving what they should? “At the heart of this work is the professional, accredited heating engineer that takes pride in their work and always delivers a safe, compliant and professional service. “As an industry professional, I understand that quality has always been high on the agenda for professional accredited installers, but rogues bring down the reputation of the highly skilled industry and paint our industry in a bad light, particularly with the UK consumer. 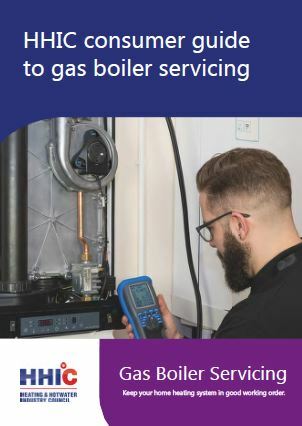 The HHIC consumer guide to gas boiler servicing is designed to raise awareness with consumers and support installers in maintaining high standards. It’s great to see that the heating industry is continuing to take steps to improve awareness of the level of service that consumers can expect on their boilers. When you take into consideration how much the average household depends on their heating and hot water system, keeping it in tip-top condition is essential. “As a consumer, it’s more than reasonable to expect a level of service across the industry and that’s exactly what we’re trying to ensure with this new guidance. “It’s a commitment, right across the board, to offer a quality service but also to make sure customers are aware of what we’re doing for them and why. Many may not have an in-depth knowledge of the industry so they need to be confident and reassured that they’re getting exactly what they need from a Gas Safe registered engineer.